"All beings are from the very beginning Buddhas." DETAILS: Ask your self are you ready to embark on a personal journey of change and life affirming practices .If you have the intention of bringing the drum and rattle into your healing practice , or for personal growth , then this course will provide you with the safe steps for creating sacred space and clearing energies whilst opening up a whole new way of mapping energies within the sacred directions, space with which you are individually connected and become more connected to as we learn to journey into the lower , middle , and upper worlds. Sacred Drumming has been used for thousands of years across many cultures. The raw hide from the animals our Ancestors killed for meat was never wasted. Dwellings, bags and clothes were made from skins and leather. The bent wood hoop covered with hide, when dry and taut, makes a very simple yet profound sacred instrument. Easy to carry, to use around a person whether sitting or lying down. The hoop drum has been used in sacred ceremony for clearing space, many types of ritual and healing. Used also for the focus through intention when meditating. For anchoring the body when using trance beat. To call on the archetypes behind the form of trees and plants. To help pull a group together, to help harmony in a work space. Your Drum for the Sacred Drumming Course! ! journey through the four seasons of the Sacred Drumming Training.! amplifies. This is a humble drum not a drum for drum circles or casual play around the fire.! Where we will make our Drum and Rattle. AT: Pen Y Cwm Workshops, Pen Y Cwm Churchstoke, Montgomery, Powys, Wales, SY156TR. COST: Course Fee: £1.000 + £120 for drum & rattle making materials. A non-refundable deposit of £320 (includes the drum & rattle making materials) is required to secure your place. Remaining cost per module is £160 payable 2 weeks before each module. 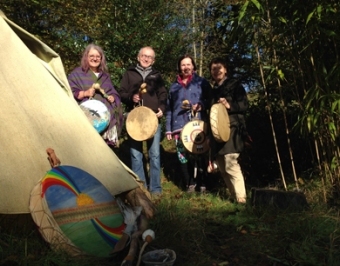 OR BOOK NOW at PayPal : Click the button below to pay £320.00 for Sacred Drumming Practitioner Course Deposit.